Haydn offers a range of garden maintenance services : Lawn Mowing, Garden Clearance, Hedge Cutting, Turfing & Pressure Washing and more. Haydn Jones was born in South Africa (to a British born mother) and has been living there since. After leaving school in 1992, he worked in the world's leading, dissolving pulp manufacturer, namely SAPPI, for over 20 year's, as a Production Supervisor. Enjoying the outdoors from a young age and owning a large property in South Africa, he developed his love for gardening! 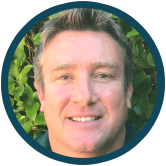 Haydn decided to change his career path in early 2016, when he decided to immigrate from South Africa to the United Kingdom, with his wife and their 3 children. Having looked at many garden franchises over the past month's, Haydn made the decision to purchase the 'Ed's Garden Maintenance' franchise. It was 'Ed's Garden Maintenance' that really caught his eye, as he found it to be a very professional operation, and he liked Ed's approach to all aspects of the business. He most certainly believes that with Ed's guidance, training and professionalism, his business will go from strength to strength and there will be many satisfied customer's a long the way. Haydn looks forward to making his customer's pleased with his service and will enjoy his journey ahead in a new country and doing what he loves best! PROMPT - RELIABLE - EFFICIENT Haydn offers a range of garden maintenance : Lawn Mowing, Garden Clearance, Hedge Cutting, Residential Blocks, Turfing & Pressure Washing. Haydn also offer's a regular fixed price garden maintenance service which is ideal for people with a busy schedule. If Haydn is busy on a job and is unable to take your call, please kindly contact the office on 01202 805 375 or 0845 108 0121. The office will send Haydn an SMS notifying them of your call and you will be contacted within the hour. Have a GREAT DAY and we hope to hear from you soon! Haydn and his colleague did a marvellous job on our overgrown hedges. He was efficient an...d professional and left the garden looking 100% better than when he arrived. He cleared away everything and, on top of all that, was cheerful and friendly! He gave excellent value for money. I highly recommend his services and he will be my first choice when I need more work done in the future. Thank you Haydn. Haydn came round at short notice and soon whipped my unruly hedges and lawn into shape. Al...l rubbish taken away plus some clippings that I'd accumulated. Excellent job, worked quickly and efficiently. Recommended highly. Lives up to the reviews already entered, quick response to phone call, arrived as agreed, ...assessed the job, gave a quote and did the job. Well done Haydn and Steve excellent service, very pleased with work done and the way it was done. Would recommend to others and ask again for my own future jobs.